Hi everyone! This particular issue of the Bulldog Jr., I’m interviewing Mr. Norton (a technology teacher for grades 7 and 8) about the technology curriculum here at the school. Here are a few questions I’ve asked Mr. Norton, and a few extra things he’s mentioned. Q: What do you do in technology class? A: Well, I teach grades seven through twelve, and basically we introduce students to the basics of technology, why it’s important. In our life, from the moment you wake up to when you go to bed you’re surrounded by technology, because tech makes life easy. Technology class is like the foundation for future engineers. We teach students how to use new machines, how to use a ruler - in inches, even though the science department and all the science teachers all want to push the metric system! We try to teach things like patience, how to draw, how to think, how to fix something whenever it breaks. That’s what an engineer does: if something breaks, someone’s gotta fix it. We do plenty of small projects; it’s an interesting field. In the high school, there are even more classes! In addition to plain Technology, we have robotics, CAD (which is computer drafting or Computer Aided Design), CAD 3D, and Construction Systems. CAD is basically a program where you draw on the computer, and it prints out whatever you draw. CAD 3D does the same thing, but with a 3D printer. You can make a bracelet or something. Construction Systems is another high school class where you learn how to use nails, hammers, how to frame a wall, designing, painting, electrical systems, the like. CAD and Construction Systems are all high school classes available to grades 9 through 12. Q: What particular topics are you going over this year, and what have you done in the past? A: This year, for the seventh graders, we’ve already done the Seven Resources of Technology poster. We’re doing the maglev trains, which involve magnetism and maglev trains. We’ll be doing wooden speakers, which you can use with your phone, as well. For eighth grade, we’ve already done candy machines. We’re also doing CO2 cars, which are basically dragsters with an engine in the back powered by compressed CO2, and we’ll be racing them down a 60 foot track. Q: What’s your favorite project done in class? A: I think my favorite is the cellphone speaker. All the students enjoy that the best! Q: Is there anything you’d like to tell anyone coming into technology in the next few years? A: Engineering can be frustrating, but don’t give up because it gets hard. We’re always looking for engineers, and if everyone just gave up, that means we’re not going to have anyone solving any future problems. Q: Can you tell us anything about you and the other teachers in the district? That’s all for our interview! Special thanks to Mr. Norton for helping us and sharing some information. Check in next time for more sneak peeks around the school. 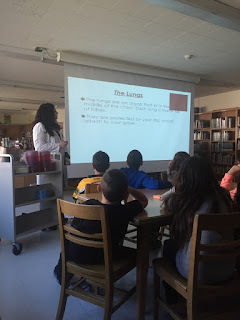 On Friday, January 15th, Island Trees fifth grade science classes participated in an assembly in the library that correlates with the fifth grade unit on the heart, lungs, and circulatory system. 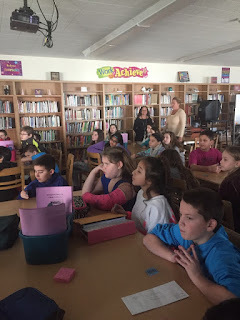 A visitor came that is very close with our beloved school librarian, Mrs. Lauber. In fact, they are so close, they are family! 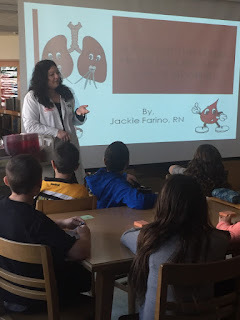 Mrs. Lauber’s sister, Jaclyn Farino, wowed the fifth graders with her presentation. She is a nurse on the cardiology floor at Good Samaritan. She is also a student at Stony Brook University, where she is pursuing a degree to become a Nurse Practitioner. 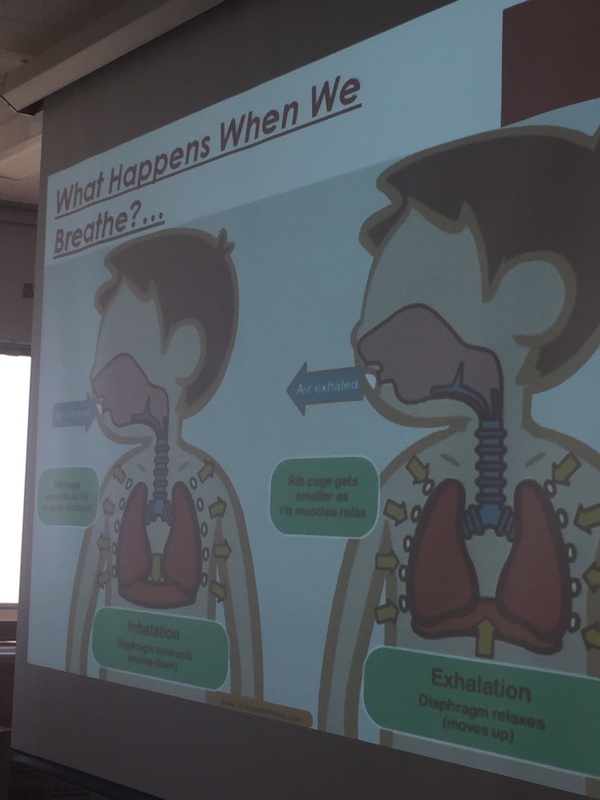 During the presentation, students knowledge about the heart and lungs were enhanced. Fifth graders participated in discussion and hands-on activities. Students also learned the importance of taking care of themselves by healthy eating and exercising. The dangers of smoking were also examined in the library. Students also participated in a heart-healthy raffle and fun was had by all. I really enjoy children's personality and enthusiasm. She loves it it's her life. There are four of us: my husband, my son, my daughter and me. What is your dream place to live? I would love to live in Manhattan! Dark purple is my favorite color. I like any Hip-hop song. I like to do The Hustle. We have three dogs and I likes to dress them up. If you were rich what would you spend your money on? Helping the homeless or buying gifts for family and students. I like to read and I’ve gone many broadway shows. Peace around the world so that everyone can travel safely. Who do you enjoy working with most of all? 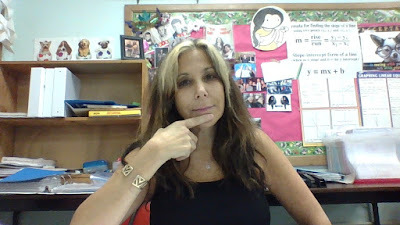 I am best friends with my entire math department in the middle school. Disclaimer: This article was written in November. There are many historical events that have happened in November. On November 1st, 1950, 2 Puerto Rican Nationalists attempted to assassinate President Harry S.Truman. The assassination was a failure and one of the men were killed. On November 2nd, 1962, President John F. Kennedy announced that Russia was removing its nuclear missiles from Cuba, marking the end of the Cuban Missile Crisis. On November 3rd, 1957, the Soviet Union launched Sputnik 2, which contained a dog named Laika. It was the first ever animal in space. On November 19th, 1863, President Abraham Lincoln delivered his famous “Gettysburg Address.” The speech was only 3 minutes long. On November 22nd, 1963, President John F. Kennedy’s term was stopped abruptly, when he was shot and killed in Dallas, Texas. He was the last president ever to get assassinated during his term in office. On November 28th, 1520, Portuguese explorer Ferdinand Magellan went through the now called “Strait of Magellan”, which is located at the southern tip of South America. He was the first to cross from the Atlantic to the Pacific Ocean. Don’t think we forgot about the birthdays! Daniel Boone, one of America’s most famous frontiersmen, was born on November 2nd, 1734. Walter Cronkite, one of America’s most famous news broadcasters was born on November 4th, 1916. James Naismith, the inventor of basketball, was born on November 6th, 1861. We actually have three very famous people that were born on November 8th. Edmond Halley, the man who discovered Halley’s Comet, was born in 1656, Bram Stoker, the author of the famous novel “Dracula”, was born in 1847, and Margaret Mitchell, author of the famous book “Gone with the Wind”, was born in 1900. World War 2 general George S. Patton, the Major general of the army at the time, was born on November 11th, 1885. Robert Fulton, the creator of the first successful steamboat, was born on November 14th, 1765. Louis Daguerre, the inventor of photography, was born on November 18th, 1789. Robert F. Kennedy, U.S senator and brother of John F. Kennedy, was born on November 20th, 1925. Billy the Kid, one of America’s most notorious outlaws, was born on November 23rd, 1859. Zachary Taylor, our 12th president, was born on November 24th, 1784. John Harvard, founder of Harvard University, was born on November 26th, 1607. Two men who were born on November 30th are Samuel Clemens (Mark Twain), one of America’s most beloved authors born in 1835 and Winston Churchill, England’s most famous Prime Minister, born in 1874. I will see you soon in the next edition of “This Month in History.” Bye! Today I will be talking about new discoveries that have sent shock waves across the scientific community. Here, I have four cool discoveries, two from the past, and two recent ones. Let’s start with a discovery that was made about 6 years ago, somewhere in 2009. A man from somewhere in the United States said that he had made a rocket that literally didn’t need fuel! But, the only thing standing in his way was NASA (National Aeronautics Space Administration).It was rejected because according the laws of space and gravity, it wasn’t supposed to work. But then, hope arrived when China saw the design and started testing it. Finally, NASA decided to take a look and test it. And then, the impossible happened! The rocket that was never supposed to work according to gravity worked when scientists built a model and tested it. This is a big discovery because now we can make rockets that do not need to run on fuel. This next discovery can help us land on a certain planet that you might know now. For over a century, scientists believed that there had once been a big ocean of water on the planet Mars. But it wasn’t until we went into space that scientists could find out the truth. And a few weeks ago, we finally discovered something that we thought couldn’t possibly be there: water! Scientists have found an underground river which is officially proof that there was in fact, an ocean on Mars. A new discovery brought up was that a scientist believes he has found proof of parallel universes. If you don’t know what a parallel universe is, let me tell you. A parallel universe is basically a copy of our universe that has copies of us and all the things in our universe. This discovery is also linked to the last discovery that I will tell you about. Black holes. You know what they are. Giant powerful holes of darkness that is so strong that not even light can escape it. Nobody really knows where the stuff is even coming from. Not anymore. A few weeks ago, a satellite showed scientists something that will change our beliefs forever. While scientists were looking at a black hole, they saw something: an object came out of it. Not impressed? Well let me tell you something.It is basically impossible for something to escape the grasp of a black hole. But anything that goes in there has to come out somewhere. This is evidence of a parallel universe because this object maybe, just maybe might of come from a different universe. I hope you liked all these exciting new discoveries and that you hope that you can make one someday. I will see you next time, bye! Have you ever wondered what light really is? It might be something that we take for granted, that we’re able to see the world around us. But take a deeper look, and you might learn something new. There are these things known as electromagnetic waves. What are they? Well, examples of electromagnetic waves would include x-rays, radio and TV waves, and light. Normally, in science, a wave is a ripple going through some kind of medium - think of a wave in a lake. Water is an example of a medium, and so is air. Most waves need a medium. Electromagnetic waves, however, don’t need one. Light is a type of electromagnetic wave. It’s the only kind that we can see. Light turns out to be the most abundant type of electromagnetic energy that the sun produces, and it’s also the best at going through water. Most other waves, like UV rays and infrared waves are absorbed instead. The funny thing is, since light is basically the same as all other types of electromagnetic waves, if you could see ultraviolet light the ocean would be the color of ultraviolet! Now, what makes something the color that it is? Basically, all materials absorb a certain color of light and reflect other colors. When a color is absorbed, you can’t see it, and when a color is reflected you can. So something that’s green would absorb all colors but green, and something that’s red would absorb all colors but red. Black things absorb all light, and white things absorb very little. Isn’t light cool? Things like this are taught in high school level classes, so now you’ve learned something new! The most popular movie in the world right now is Star Wars VII: The Force Awakens. The budget to make this movie was over $200 million, but in just over two weeks it has made $1.3 billion, and hasn’t even opened in China! I have been a big fan of the movies, the spin off cartoons, all of the Star Wars video games and toys for as long as I can remember. So you can imagine my excitement when I got the chance to see the actual costumes and props in Discovery Times Square in New York City. The exhibition held about 70 of the original costumes from the Star Wars movies, and a lot of weapons, props, and behind the scenes information. I learned that some of the costumes worn by Princess Amidala were actually based on Mongolian princesses. I also learned that the Darth Vader costume was designed to resemble a Japanese Samurai. And something very shocking that I learned, Boba Fett’s costume was originally supposed to be the costume for Darth Vader! Some other costumes I saw there were Chewbacca, Han Solo, Luke Skywalker, C3PO, R2D2, Darth Vader, Princess Amidala and Leia, Anakin Skywalker, and Yoda. They even had costumes from the new movie, such as the stormtroopers, an X-wing pilot, Rey, Finn, and even the actual BB-8 droid! I highly recommend checking out this amazing exhibit. For tickets and more info, you can contact Discovery Times Square at 866-987-9692. January is a month that is filled with so many events that shaped the United States and the world. Here are some of those events. On January 1st, 1863, Abraham Lincoln signed the Emancipation Proclamation stating that all slaves in the Confederacy would be free. Also on January 1st, 1959, Fidel Castro overthrew the Cuban government after a few years of revolution. On January 4th, 1790, President George Washington delivered the first presidential state of the union address. On January 11th, 1964, the U.S. Surgeon General declared that cigarettes were bad for people’s health. On January 15th, 1535, King Henry VIII of Britain declared himself the head of the English Church after breaking away from the Vatican and the Pope. On January 24th, 1848, the California Gold Rush started after John W. Marshal discovered a gold nugget in a California river. On January 27th, 1967, 3 astronauts were killed in a tragic fire that engulfed Apollo I. Also on January 27th, 1973, the U.S. involvement in the Vietnam War ended when American representatives signed a peace treaty in the city of Paris. On January 28th, 1915, the U.S. Coast Guard was created when Congress combined the Life Saving Service and the Revenue Cutting Service. Also on January 28th, 1986, the U.S. space shuttle Challenger tragically exploded, killing all seven crew members. Now here are some historical birthdays. On January 1st, 1735, Paul Revere, who was famous for his midnight ride, was born, and on January 1st, 1752, Betsy Ross, the person who is credited with making the first American flag, was born. Born on January 6th, 1412, Joan of Arc, the famous women knight who fought for the French in the Hundred Years’ War. On January 8th, 1935, Elvis Presley, the world famous musician known as “the King of Rock”, was born. On January 11th, 1755, Alexander Hamilton, the first Secretary of the Treasury, was born. On January 12th, 1737, John Hancock, the first signer of the Declaration of Independence, was born. On January 14th, 1741, Benedict Arnold, a U.S. general who later betrayed the United States and joined the British, was born. On January 15th, 1929, Martin Luther King Jr, the famous African-American civil rights leader, was born. Two famous men were born on January 17th. In the year of 1706, Benjamin Franklin, the famous American scientist, was born. In the year 1942, Muhammad Ali, the famous multi time World Boxing Champion, was born. On January 19th, 1807, General Robert E. Lee, the Confederate general that led all Confederate forces during the Civil War, was born. Born on January 27th, 1757, Wolfgang Amadeus Mozart, the famous Austrian composer. Also on January 27th, 1859, Kaiser Wilhelm II, the leader of Germany during World War I, was born. On January 30th, 1882, Franklin Delano Roosevelt, the president during World War II, and creator of the now famous “New Deal”, was born. And born on January 31st, 1919, Jackie Robinson, the first African-American baseball player who played for the Brooklyn Dodgers. I hope you enjoyed this edition of This Month In History and can’t wait for the next installment of it! Goodbye! The month of December is filled with many historic events and birthdays. Here are fifteen events that shaped our world. On December 1st, 1955, the modern civil rights movement began when Alabama resident Rosa Parks refused to give up her bus seat to a white man causing the beginning of the bus boycott which lasted a whole year. The Supreme Court later banned segregation on buses. On December 2nd, 1804, Napoleon Bonaparte was crowned king of France by Pope Pius VII. He would stay king until he was banished to the island of Elba in 1815, until he died in 1821. On December 2nd, 1942, physicists led by Enrico Fermi, carried out the first successful nuclear chain reaction in the world. This lead to the creation of the first nuclear bomb. On December 3rd, 1967, the world’s first successful heart transplant was performed in Cape Town, South Africa. The patient lived for another 18 days. On December 5th, 1933, the 18th Amendment of the Constitution (which banned alcohol in 1920) was repealed due to non-stop illegal alcohol manufacturing, transportation, and selling. On December 6th, 1865, the 13th Amendment of the Constitution was ratified, marking the end of slavery. On December 7th, 1941, Japanese fighter planes bombed the American naval base Pearl Harbor in the Hawaiian islands, which left 3,000 Americans dead. This signaled America’s entry into World War 2. It was considered the worst disaster in American history until September 11, 2001. December 8th has a few events. In 1941, a day after the attack on Pearl Harbor, the United States and England declared war on Japan. In 1980, former member of the Beatles John Lennon was assassinated in front of a hotel in New York City. The Soviet Union finally collapsed after 69 years of communism in 1991. On December 11th, 1901, the first transatlantic radio signal was sent by Guglielmo Marconi to Cornwall, England. This would later make a huge impact on the telephone. On December 14th, 1799, America’s first president George Washington died at Mount Vernon, due to a sickness called acute laryngitis. He had retired 3 years earlier. On December 16th, 1773, the Boston Tea Party occurred. Colonist dressed as Mohawk Indians dumped 342 containers of tea into Boston Harbor. On December 17th, 1903, the Wright brothers flew their first successful flight in Kitty Hawk, North Carolina. South Carolina, on December 20th, 1860, became the first state to secede from the union sparking the beginning of the Civil War. Now we have ten birthdays of people who have shaped our world. On December 5th, 3 famous men were born. Martin Van Buren, our 8th president, was born in 1782 in New York. George Armstrong Custer, the famous union general who died fighting against Sioux Indians with 200 of his men, was born in 1839. Walt Disney, the founder of one of the most famous movie companies in the world, Disney, was born in 1901. On December 8th, 1765, Eli Whitney, the inventor of the cotton gin, was born. On December 13th, 1818, Mary Todd, the wife of Abraham Lincoln, was born. On December 15th, 1832, Alexander Eiffel, a designer of both the Statue of Liberty and the Eiffel Tower, was born. On December 16th, 1770, Ludwig van Beethoven, the famous musician and composer, was born. On December 21st, 1879, Josef Stalin, one of the most famous leaders of Russia, was born (as Iosif Vissarionovich Dzhugashvili). On December 25th, 1642, Isaac Newton, the famous English mathematician and scientist, was born. On December 28th, 1856, Woodrow Wilson, the 28th president and our president during World War 1, was born. I hope you enjoyed this installment of “This Month In History” and can’t wait to see the next one! Bye!